Some days a girl just needs brownies... especially fancy, two-bite cuties... enough said! Ingredients: sugar, butter, cocoa powder, vanilla, eggs, flour, baking powder, salt and Snickers (or other yummy (and FREE) candy bars... peppermint patties are also awesome with this recipe!). 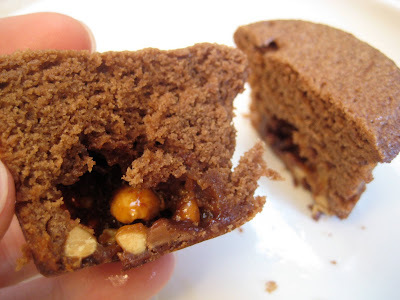 Start by slicing your candy bars and placing them in your baking "pan." I recommend doing this first because once you get a whiff of your brownie batter, you want to taste the finished product asap! I cut my (FREE) Snickers into 8 even pieces per bar! Start by melting your butter, and then add the sugar. 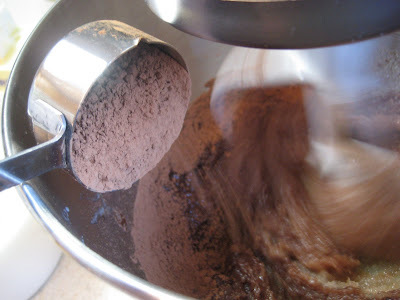 Start spinning your mixer and add some cocoa powder... do NOT be tempted to sample the cocoa- just trust me!!! Add vanilla, take a deep whiff, because this is when the brownie mix really begins to smell delicious! This recipe calls for 4 eggs, which makes cake-like brownies. Next time I'm planning to add just 2 eggs since I really like fudgy brownies! Next add your flour, a little bit at a time! And lastly, add the salt. Seriously, how beautiful is that batter? YUMMY with a sweet surprise inside! Bake at 350* for 20-30 minutes! These look very good - I'm such a chocoholic and I do have some of those snicker bars still (amazingly). What do you think the cost of these are vs a store-bought box of brownie mix? We like Ghiradelli brand from Costco and some others too - nice to have on hand for a quick dessert. I'd say that by spending coupons, this batch of brownies cost about $1.50 to make... not bad, but its easy to pick up a box for $1 on sale. Basically, this is a great recipe for using FREE candy bars- with either store bought or home made mix! What type of pans did you use? They look to be mini silicone and the brownies came out so cleanly. These pans were purchased with a gift card from our wedding- at Crate & Barrel, they were on sale for $8.50, but they normally sell for $12... YIKES! But I LOVE them! I love Ghiradelli brownies too! But I've been noticing that almost all premixed boxes(especially cake) have partially hydrogenated oils in them (aka trans fat), so the more homemade we can do the better for us! I did just pull out my Ghiradelli box though and they don't have PHOs in them! Good to know! I'm definitely reading more box labels these days... and I don't like what I'm reading!! !